If you’re taking bowling from the occasional hobby to a more regular one, then it’s time for you to get your own pair of bowling shoes. 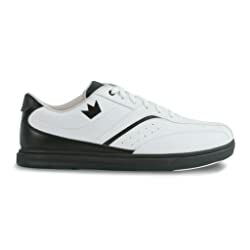 Stop renting a pair from your local bowling alley and get a pair that help prevent you from sliding or dragging your feet each time you step up to the line. It might surprise you to find out that there are a lot of different options out there when it comes time to shop for the best bowling shoes on the market. You can find lots of great pairs for both men and women. To help you make a solid decision on which pair best meets your playing needs, let us recommend a few of our favorite pairs and give you some tips on what to look for when comparing different pairs of shoes for bowlers. editor ratings based on value, comfort, quality and durability of the shoes. **This page contains some affiliate links and GamingWeekender may be compensated if you make a purchase after clicking on the links. You might be content to just continue renting a pair each time you visit the local bowling alley, but you should really stop doing that. Would you rent a pair of running shoes if you took up running? No, because you need something with good support and performance, right? The same is true for bowlers like you. The basic models give you good comfort and stability when you’re playing a game or two. And if you’re really serious about your game, then you can get a more high end pair that gives you protection against slipping and toe dragging. The better the bowling shoe, the more control you get over your motion and performance in the lane. Plus, there’s just that gross-out factor that comes with renting and wearing shoes that other people have sweated in – lots of other people! After around five trips to the local bowling alley, you’ll often break even in terms of the cost of a good pair of bowling shoes versus renting the shoes for those five trips. It just makes good sense for you to have your own pair. Athletic bowling shoes are typically cheaper in price and perfect for the hobbyist recreational bowler. And they are the perfect choice for beginners who don’t aspire for professional game play. The sliding soles on these are pretty similar to the rental shoes at your local alley. And, they work for both right-handed and left-handed bowlers. Professional bowling shoes are typically more expensive to buy and really designed for the serious bowler. A pair of these has one shoe that has a rubber sole for breaking, and the other shoe features a slick sole used for sliding. And it’s common for this type to have interchangeable and removable sole capabilities. Now that you know which type of shoe is best for your needs, it’s time to consider a few other things before you pull the trigger on your purchase. Below are a few features and other things for you to consider. Do you need left or right-handed shoes? If you’re going for a pair of performance shoes, then you have to know if you need a left-handed or right-handed pair. This doesn’t mean with hand do you write with, but which hand do you release the ball with, instead. So, if you release the ball with your right hand, buy a pair of right-handed shoes. And if your ball hand is the left one, get a pair of left-handed shoes. If you’re getting the ‘athletic’ type, then you don’t need to worry about this. Okay, so you’re a serious bowler and going with a performance pair of shoes. Good choice! But you also need think about interchangeable or replacement slides for better performance out there. You’ll notice that the sliding soles are rated on a range of one to 10, with one meaning they give minimal slide and a 10 meaning the sole gives maximum slide. Keep in mind that lane conditions tend to dictate with level of slide is the best for the game. For instance, if you’re in a cold New York winter, then you’ll want a lower slide rating to help you out on the cold, slick surface. But, if you’re playing in humid New Orleans, then you’ll prefer maybe an 8-rating slide to help you move on the lane floor. You’ll also want a high slide rating if the land has a scuffed floor. If you know what size you wear in a regular shoe, then you already know what size you need for your bowling shoes. It’s really that simple. 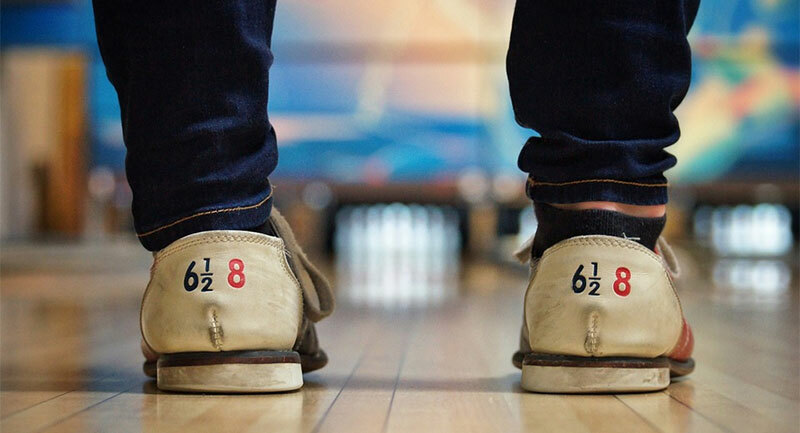 When you’re wearing your new pair of bowling shoes, they should fit like a regular pair of athletic shoes. Your heel should not slip in the back and your foot should feel adequately supported without feeling too tightly wedged into the shoe. And your toe area should have around a quarter of an inch between the tips of your toes and the end of your shoe. As you walk in the shoe, it should not slip and your foot should not move around. If you have wide feet, then you need to choose bowling shoes for wide feet for the best fit. And if you tend to have sweaty feet, then be sure to choose a pair that has breathable uppers for air flow. To help make your decision just a bit easier, we have taken the time to share out thoughts on a few of our favorite pairs to buy right now. Below you’ll see what we like and don’t like about each pair. Though it may not be the most attractive option on the market, right now the Brunswick Vapor Mens Bowling Shoe is our favorite option for the guys who want a good beginner’s shoe. It is made by one of the top brands in the industry and offers a comfortable fit for a night in the lane. Overall, we find the price to be very affordable if you’re in the market for cheap bowling shoes that will last you for a while. Plus, they are comfortable after several years of hobby playing on weekends, in our experience. That’s why these get our pick as the best bowling shoes for men! Our favorite option for women right now are the KR Strikeforce Ladies Kross Bowling Shoes. These are great looking – not that typical plain white that you so often see. They have an athletics sneaker design, which makes it no surprise that these are the athletic type of bowler’s shoe. When in use, they breath well so you don’t need to worry too much about sweaty feet. And they offer good performance in the lane, thanks in part to the #8 white microfiber slide pad on both shoes with GlexSlide Technology. Overall, the KR Strikeforce Ladies Kross Bowling Shoes offer high quality at an affordable price. That’s why these get our pick as the best bowling shoes for women! If you have wide feet, then you need a good pair that comes in a wide width to keep your feet comfortable. Below are the best options we’ve seen for both men and women bowlers. If you’re a guy with wide feet who likes to bowl, then you will get a lot of comfort out of these shoes from Dexter. The Dexter Turbo II Wide Width Bowling Shoes are in the athletics style and available in a nice classic black color. They have an affordable price and are comfortable to wear. Plus, they’re made by one of the top brands in the industry. So, if you have wide feet, we think this is a great choice for you guys. For the ladies with wide feet, the Dexter Women’s Groove II Wide Bowling Shoes is our top pick when it comes to a good option that is both comfortable and stylish (we hate those plain white options!). Like the men’s option above, these are very comfortable and have a good price. We really enjoy the nice black and white design of these. And, they are the athletics-type of bowler’s shoe and should work for almost anyone. Overall, getting yourself a good pair of shoes for bowling is a quality investment that can help improve your performance in the lane. Plus, buying your own pair saves you money over time since you no longer have to rent a grimy old pair of rental shoes. very informative article about choosing the best bowling accessories it will help everyone to choose the best bowling shoes available in the market.